Background: Moyamoya disease is a rare, progressive cerebrovascular disorder caused by intracranial stenosis of the circle of Willis, resulting in successive ischemic events. 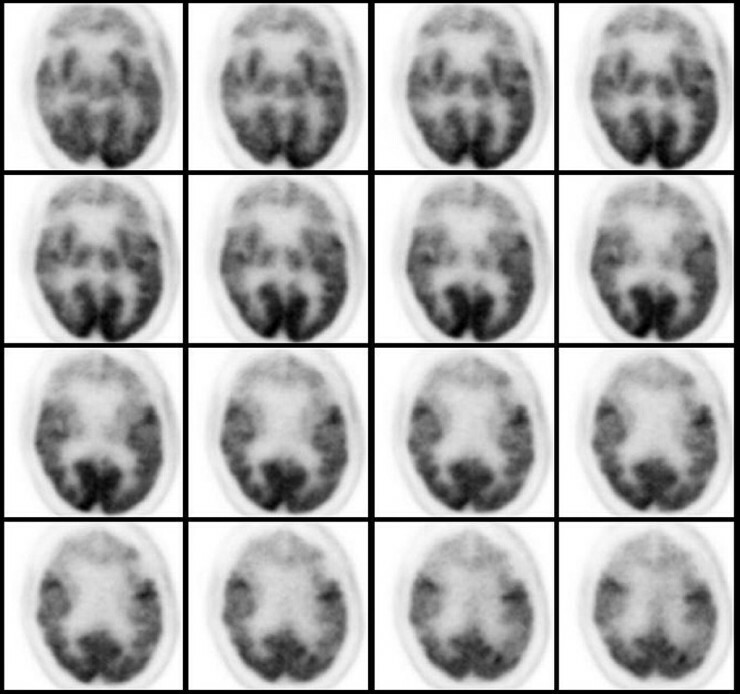 Computed tomography (CT) and magnetic resonance imaging (MRI) play a major role in diagnosis. Objective: The aim of the study was to describe the spectrum of findings on brain SPECT in patients with Moyamoya disease and to compare the findings with other investigations. Materials and Methods: Tc99m-ECD SPECT scans of seventeen patients (7 children and 10 adults) were analysed to study the brain perfusion. Results: Features of Moyamoya disease were detected on DSA in 11 patients, CTA in one, MR angiography in one patient. Brain perfusion SPECT analysis showed unilateral perfusion defects in 11 patients, normal perfusion in 2 and bilateral defects in 4 patients. No perfusion defects despite bilateral vascular changes were noted in one patient. Cerebral infarcts were detected on MRI unilaterally in three subjects while multiple infarcts were identified in one. Tc99m-ECD Brain SPECT showed perfusion defects that were more extensive compared to those detected on MRI. Post acetazolamide studies for assessment of cerebrovascular reserve were done in three patients. Two of them showed good cerebrovascular reserve (>1). Follow-up studies post-surgical procedures (Myo-dura synangiosis) done in two patients showed partial resolution of perfusion defects in the involved areas. Conclusion: Brain perfusion scintigraphy is an important adjunct in evaluation of patients with Moyamoya disease yielding information about the direct end results of the pathology in the vessels and also prognostic information. 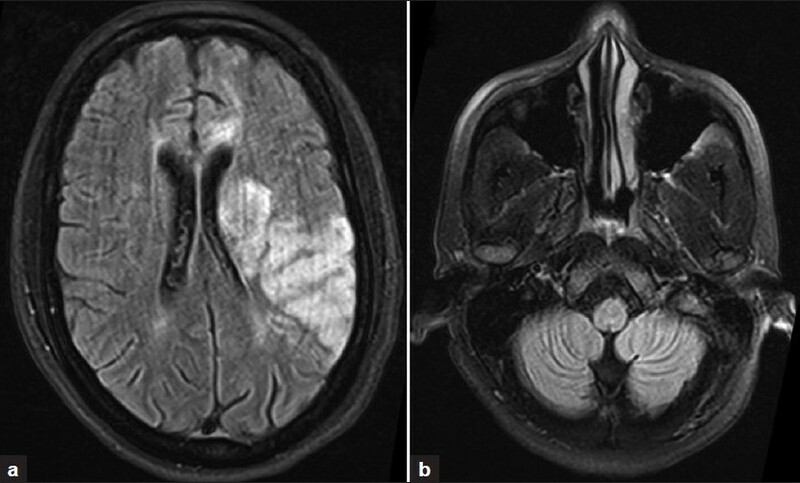 A 10-year-boy post-operative, post-radiotherapy case of left temporal glioblastoma multiforme (GBM) was referred for F-18 Flurodeoxyglucose (FDG) Positron emission tomography/Computed Tomography (PET/CT) to rule out residual/recurrent disease 6 months following completion of therapy. The FDG scan 3 months following therapy had not shown evidence of viable residual or metastatic disease. The present scan showed a tiny focus of abnormal FDG accumulation in the region of the trigone of the left lateral ventricle which was best appreciated on the plain PET image. A correlative C-11 methionine study showed a well defined focus of abnormal tracer accumulation in the region of the left trigone. 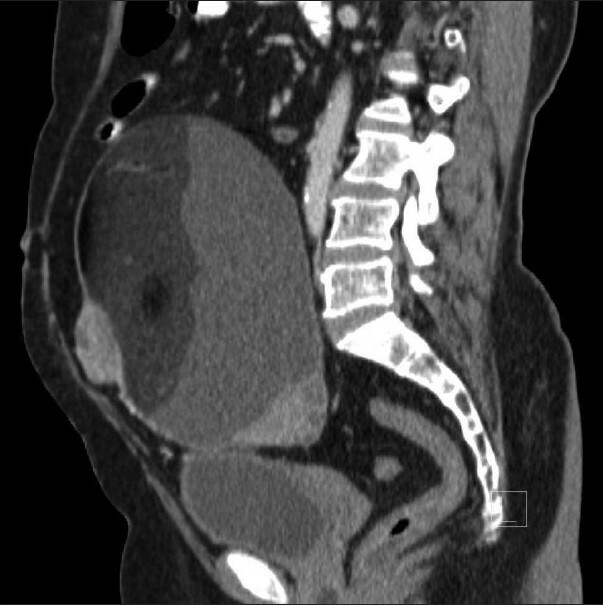 CECT and MRI done subsequently proved it to be a subependymal deposit. This case therefore demonstrates the possibility of subependymal deposits in GBM and the need for this possibility to be entertained during interpretation of the FDG study. It also highlights the advantage of labelled amino acids like C-11 methionine for clearly delineating subependymal deposits apart from the advantage for unequivocal interpretation of the PET study in recurrent brain tumors. 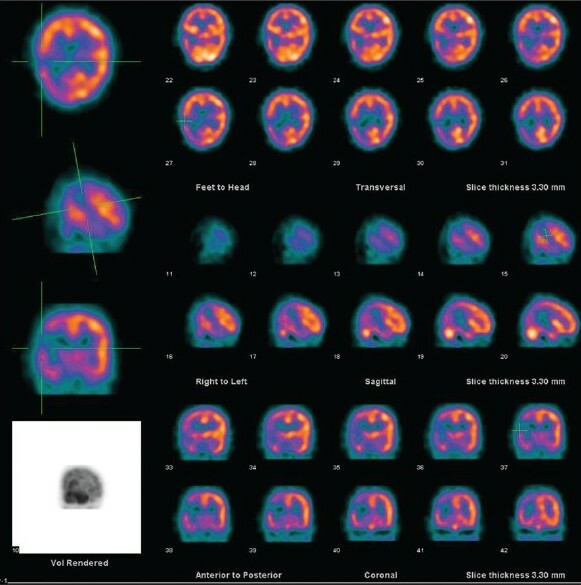 Interictal Brain F-18 fluorodeoxyglucose (FDG) Positron Emission Tomography (PET) imaging has been widely used for localizing the focus of a seizure. Hypometabolism in the extratemporal cortex on FDG-PET study is an important finding to localize seizure focus, which might be seen as ipsilateral, contralateral or bilateral thalamus hypometabolism in epileptic patients. In this case report, it is aimed to show ipsilateral thalamus hypomethabolism on FDG PET brain study of a 24-year-old male patient with temporal lobe epilepsy. Fronto-temporal lobar degeneration (FTLD) is a clinically and pathologically heterogeneous syndrome, characterized by progressive decline in behavior or language associated with degeneration of the frontal and anterior temporal lobes. Three distinct clinical variants of FTLD have been described. Despite the difficulties, accurate diagnosis is critical because the clinical management differs for Alzheimer's disease (AD) and FTLD. 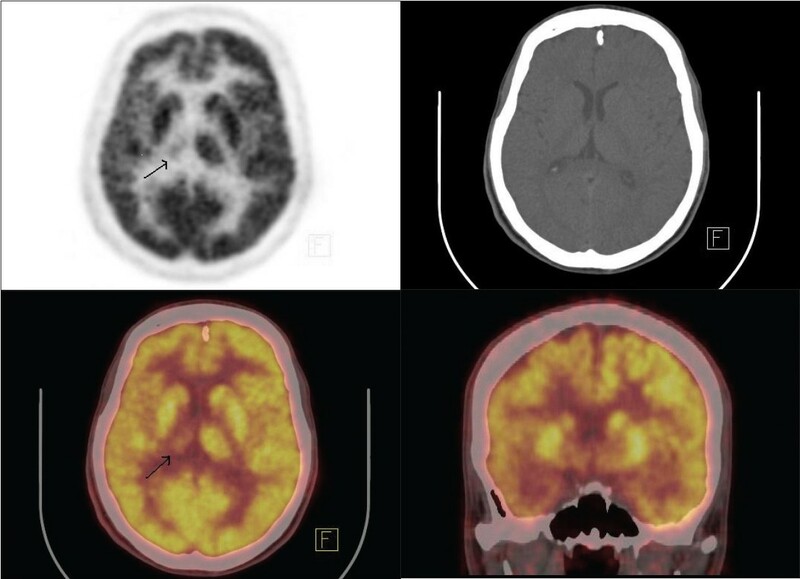 Positron emission tomography with fluro-deoxy-glucose (FDG-PET) typically shows sufficient abnormalities that can be used to improve the accuracy of distinguishing AD from FTLD in individual cases. Though temporo-parietal hypometabolism is sensitive in diagnosis of AD, it is less specific. The importance of evaluating the cingulate and anterior temporal cortices for arriving at a diagnosis of FTLD is stressed. 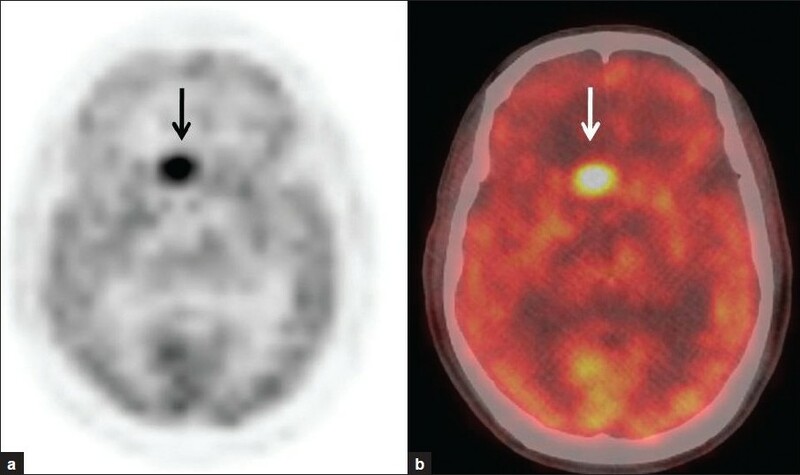 The case reported here was that of an old woman characterized by pancytopenia, chromosome clonal abnormality, fluctuation of the percent of blast cells at 20%, and negative evidence of malignancy in whole-body 2-[F18] fluoro-2-deoxy-d-glucose positron emission tomography (F18-FDG PET). After about 10 months, the blast cells accounted for about 25%, the morphology of which was similar to that of previous ones, and F18-FDG PET demonstrated diffusing increased uptake in the right upper leg and lymph nodes and patchy high uptake of bone marrow. 2-[F18]-fluoro-2-deoxyglucose can reflect extramedullary infiltration and bone marrow cellularity of the whole body, compared with invasive, regional biopsies and aspirations. The value of 2-[F18]-fluoro-2-deoxyglucose or 3'-deoxy-3'-[F18]-fluorothymidine positron emission tomography as an indicator in predicting the transformation of myelodysplastic syndrome to acute myeloid leukemia needs to be explored in the future. Urinary tract infection (UTI) is the most common infection contracted by renal allograft recipients. In patients of autosomal dominant polycystic kidney disease (ADPKD), cyst infection presents a complex diagnostic and therapeutic challenge especially in the post transplant period. Accurate diagnosis forms the cornerstone in salvaging the graft from potentially catastrophic outcome. We describe a case of xanthogranulomatous pyelonephritis (XPN) in the native kidney in a patient of post transplant ADPKD which presented as frequently relapsing UTI with graft dysfunction where in accurate diagnosis was made possible with the aid of 18-fluorodeoxyglucose (FDG) - Positron emission computerized tomography (PET/CT). An 18-month-old boy with history of fever of 4 months duration and with swelling of the limbs was referred for a bone scan. There were multiple swellings over his upper and lower limbs, with bowing of the lower limbs. His radiological skeletal survey revealed marked periosteal new bone formation surrounding the diaphysis of long bones. A bone scan done with 99m Tc-MDP showed diffusely increased tracer uptake in all the long bones. 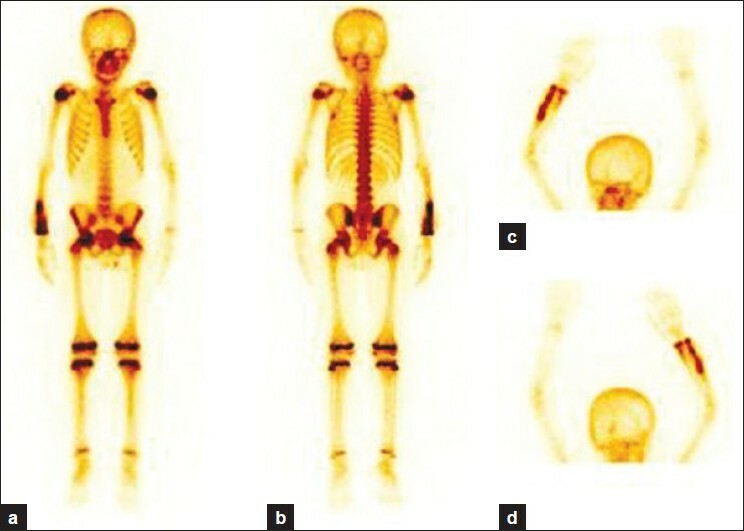 A fluorodeoxyglucose positron emission tomography (FDG PET) scan done to assess the metabolic activity showed patchy FDG uptake in the long bones, ankle joint and anterior ends of few ribs. 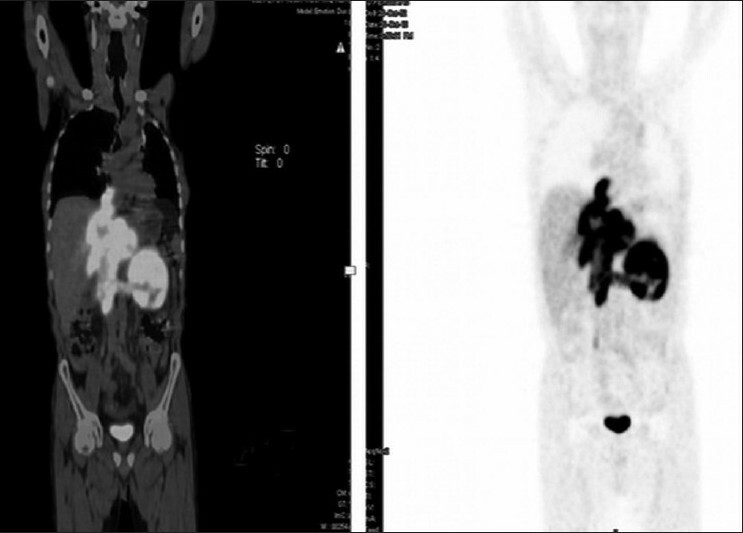 His clinical and imaging findings led to the diagnosis of Caffey's disease. 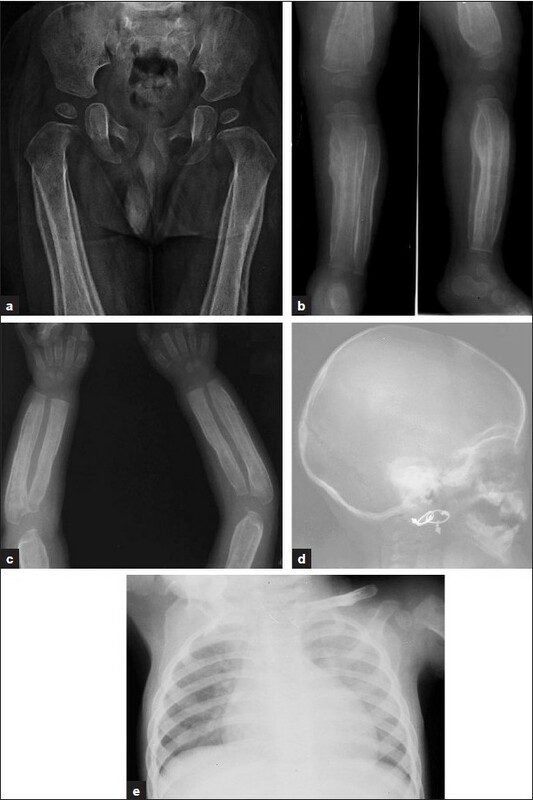 Osseous metastases from retinoblastoma, the most common ocular malignant neoplasm of childhood, are reported most commonly in the skull and long bones. However, metastases to forearm bones are very rare. Here we present a case of bilateral retinoblastoma with metastases to right forearm bones four years after the initial treatment. Tumor thrombus is a rare complication of solid cancers, mainly seen in cases of renal cell carcinoma, wilm's tumor, testicular carcinoma, adrenal cortical carcinoma and hepatocellular carcinoma. Tumor thrombus in inferior vena cava is a rare complication of primary carcinoma lung. It should be identified so as to rule out venous thromboembolism and avoiding unnecessary anticoagulant therapy. 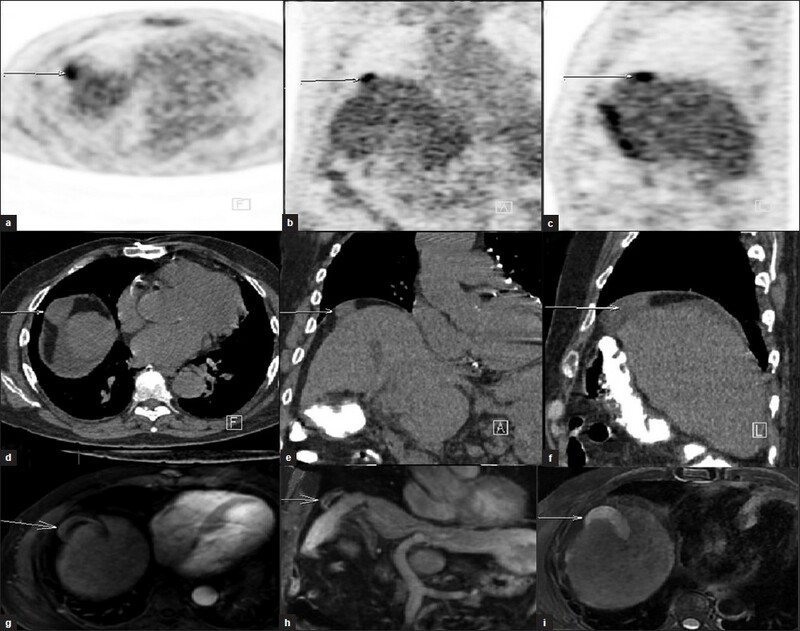 We describe a case where F18-Fluorodeoxyglucose (FDG) positron emission tomography - computed tomography (PET/CT) helped to identify extensive tumor thrombus. 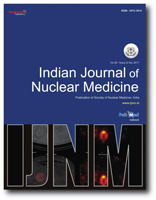 The purpose of this study was to appraise the imageologists of a possible mislocalization of tracer accumulation to anomalously placed gallbladder during positron emission tomography-computed tomography (PET/CT) examination. PET/CT is increasingly playing an important role in staging and restaging of the disease process in cancer patients. 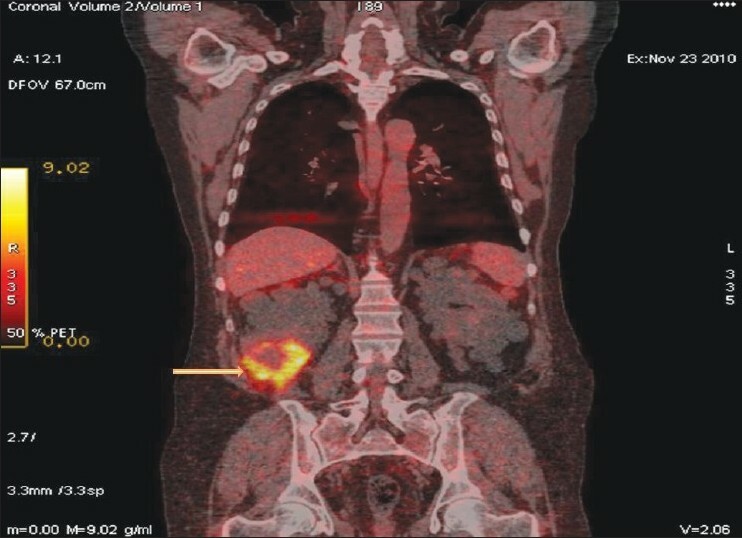 With the advent of fusion imaging, the tracer accumulation can be correctly localized to a structure or lesion on CT. We did a staging PET/CT scan of a patient with hepatocellular carcinoma for liver transplant evaluation. 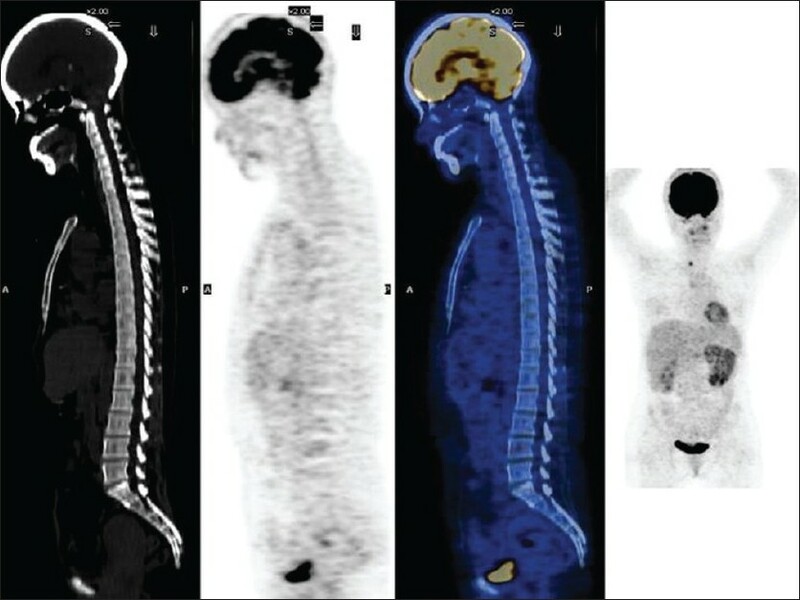 Fluorine-18 fluorodeoxyglucose (F-18 FDG) was used as a tracer and the scan was performed on SEIMENS Biograph-mCT PET/CT machine. We noted the tracer accumulation at the superior surface of liver, which was localized to the anomalously placed gallbladder in suprahepatic subdiaphragmatic location. The anomalously placed gallbladder can create localization confusion. Keeping the possibility of ectopically placed gallbladder in mind, the imageologist can better localize the tracer uptake. 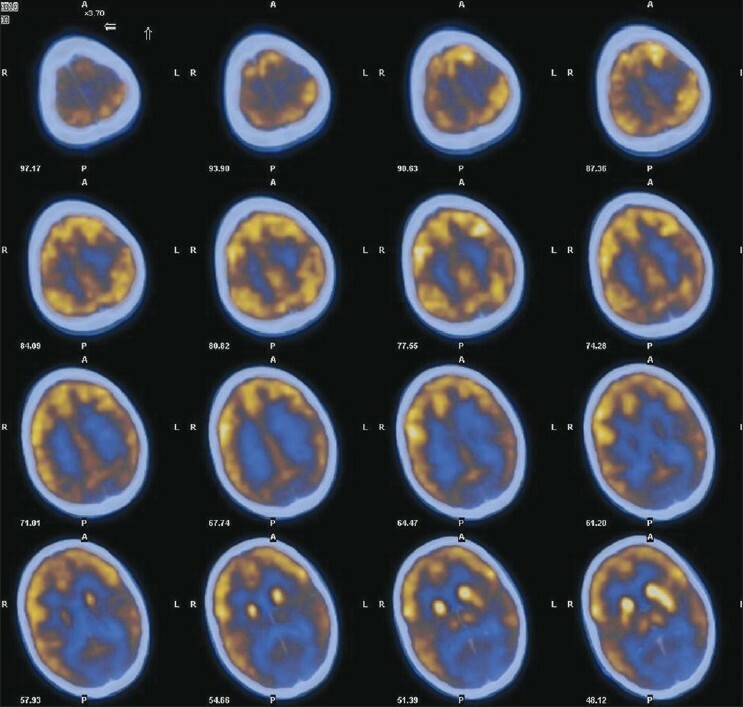 We present the pattern of metabolic brain abnormalities detected in patients undergoing whole body (WB) F-18 flurodeoxyglucose (FDG) positron emission tomography/computed tomography (PET/CT) examination for non-central nervous system (CNS) malignancies. Knowledge of the PET/CT appearance of various intracranial metabolic abnormalities enables correct interpretation of PET scans in oncological patients where differentiation of metastasis from benign intracranial pathologies is important and improves specificity of the PET study. A complete clinical history and correlation with CT and MRI greatly helps in arriving at a correct imaging diagnosis.